The performance SNARE is approximately 15 minutes in length. 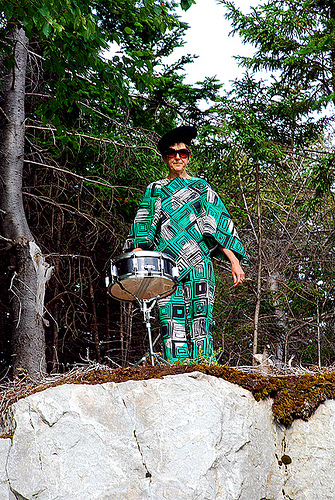 The performer is dressed in a sixties camouflage pant suit, hat, sunglasses and bug net. She stands on a high stone outcrop that towers over the audience. She is engaged in gathering sticks and stones found in the local area. She then bounces these items on the drum head surface. The activity slowly begins and builds as the action becomes more intense. This creates an erratic audio experience for the listener.